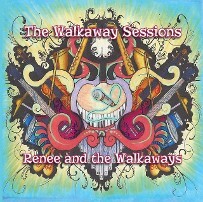 "THE WALKAWAY SESSIONS" RELEASED JAN 2014! It's the end of the day. I am watching you play. Warm waves flowing all around. You bring me seashells you have found. You are so beautiful my child, innocent and so young. My love is overwhelming as I watch the setting sun. Your little hand in mine. Darkness finally coming down. I never want to lose this feeling so profound. It's moments just like these, that are truly heartfelt. Don't lose sight of this my child on your journey to grow old. The most precious advice you will ever be told. You will surely make mistakes. You are my greatest gift. This can never be denied. Just one wish come true. Keep your heart open, forgiving and free. It's the journey you will see. Keep your heart open and your head held up high. Cherish each moment given as it becomes time gone by. "The genesis of this easy-rocking, blues-belting, soul-lifting collection of songs has probably played out — with far less success — on a million couches, in a million musician’s living rooms. Renee Cheek and David Hyde started with a wish list of guests. Cheek, a singer just as adept at the winking aside as the sultry come on, and the Julliard-trained bassist Hyde even arranged the songs on The Walkaway Sessions with certain all-star voices in mind. Who hasn’t thought something along those lines? You can imagine the conversation playing out: What if Dr. John played keyboards on my song “Finally Found,” or “Goodbye Bobby Charles” — or both? Wouldn’t “Fool” and “A Song for Robert” sound cool with the addition of Augie Meyers of the Sir Douglas Quintet? Marty Balin, the guy from Jefferson Starship? Thing is, all of that happens on The Walkaway Sessions — impishly named, since that’s what all of these famous folks did: Play their ever-loving asses off, then split."